Iraq's electoral commission released the initial results of the parliamentary elections in the early hours of Monday. With 95 percent of the votes from 10 of Iraq's 18 provinces tallied — more than half of the total votes — the firebrand nationalist Shiite cleric Muqtada al-Sadr was leading, in what would be an unexpected political comeback. If results hold, they would spell bad news for the country's current leader, Prime Minister Haider al-Abadi, who had been seen as the narrow frontrunner prior to the vote. Muqtada al-Sadr's Sairun list leads in four provinces, including the capital, Baghdad. Shiite militia leader Hadi al-Amiri's bloc, which is backed by Iran, is currently in second place. PM al-Abadi's Victory Alliance has so far only won in one province and sits in third place. A splintered Shiite majority looks likely and would mean that no single electoral alliance will secure enough seats to govern alone. The record-low turnout — 44.52 percent — has been attributed to problems with the country's new electronic voting system and voter disenchantment. The number of voters was significantly lower than in previous elections. The tallied votes included full returns from only 10 of the country's 19 provinces. The situation may still change due to the country's complex electoral arithmetic. Complete results may not be released for another few days. Potential problems in Kirkuk: Tensions erupted in the ethnically diverse province of Kirkuk on Saturday night after preliminary results showed that the Patriotic Union of Kurdistan (PUK) was making significant gains. Security forces were called on to take control of the situation and maintain "neutrality" in the electoral process. The Arab and Turkmen political parties in Kirkuk have given an independent commission in charge of the election 24 hours to start a manual recount, local politician Ershad Salihi, the head of the Iraqi Turkmen Front, said. Al-Sadr's supporters jubilant: After the announcement that Muqtada al-Sadr's movement Marching Towards Reform was leading the polls in Baghdad, supporters took to the streets in the capital to celebrate a win. Supporters, mostly young people, waved flags, held pictures of the nationalist cleric, and set off fireworks. Al-Sadr campaigned on an anti-corruption platform and formed an unlikely alliance with communists and other independent secular supporters. Read more: What does Shiite power broker al-Sadr want from Iraq? Trouble for the United States? Muqtada al-Sadr has a colorful history with Washington. A militia under his control waged a brutal and costly insurgency against coalition troops after the 2003 invasion of Iraq. The US labeled him a "terrorist" and issued an arrest warrant for the cleric, who then fled to Iran to enroll in religious studies. But when US troops were withdrawn in 2012, al-Sadr came back to Iraq and instructed his army to lay down their arms. The cleric withdrew from politics, later re-emerging as a fierce critic of Prime Minister al-Abadi in 2016. He has been called an anti-American militant, a cross-sectarian reformer and a new hope for Iraq. From waging war against US troops to winning big at elections, DW explores the evolution of Muqtada al-Sadr. The Iraqi parliament has met for the first time since elections in May. Prime Minister Haider al-Abadi is hoping to form a majority coalition and sideline his rivals, led by former Prime Minister Nouri al-Maliki. 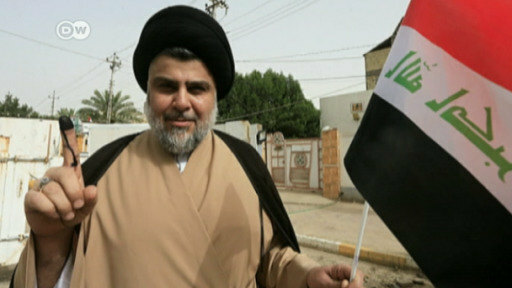 Iraqi cleric Muqtada al-Sadr came to prominence after the US invasion of Iraq. His militia was reportedly responsible for violence against Sunni Muslims and an insurgency against US forces. Now he has invented himself as a peacetime political figure.